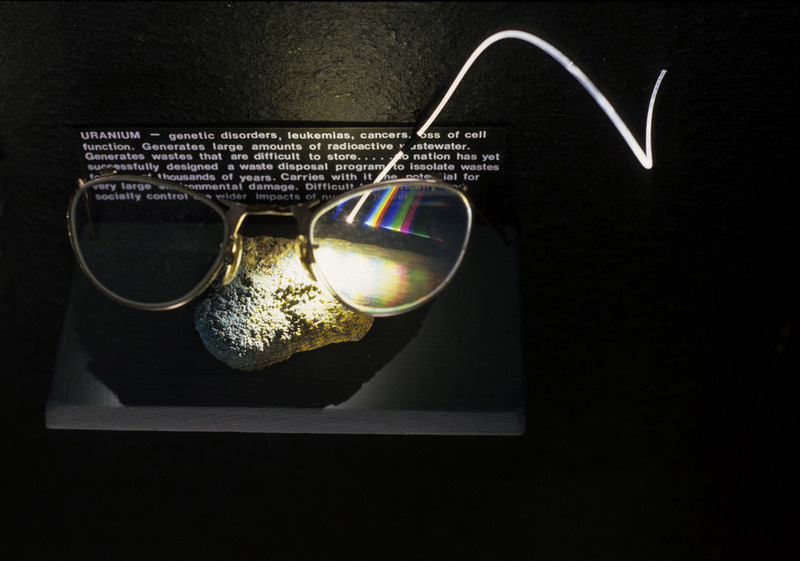 Click to Enlargedichromate holograms, pumice crete, motors, turkey feather, roofing paper, antique spectacles, solar cell, translucent fabric, fiber optics, halogen lights, horsetail reed, assorted materials. 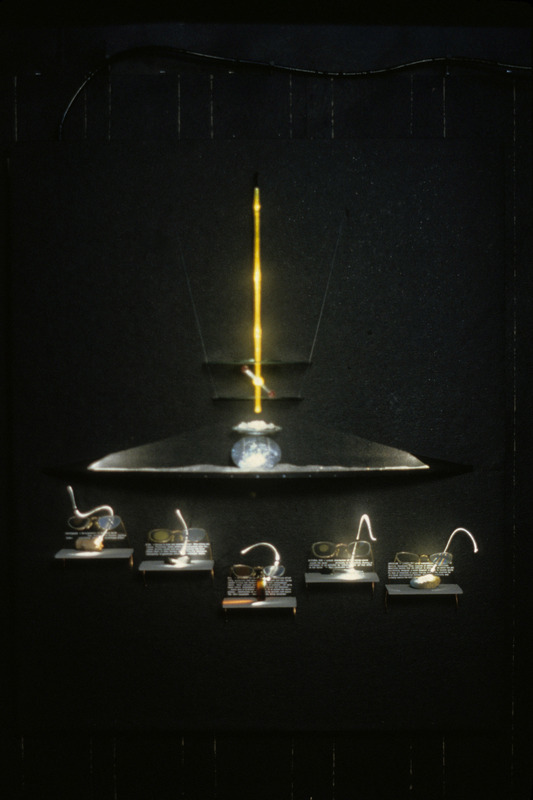 One installation in a series of works resulting from research into the current state of solar technology at the time. 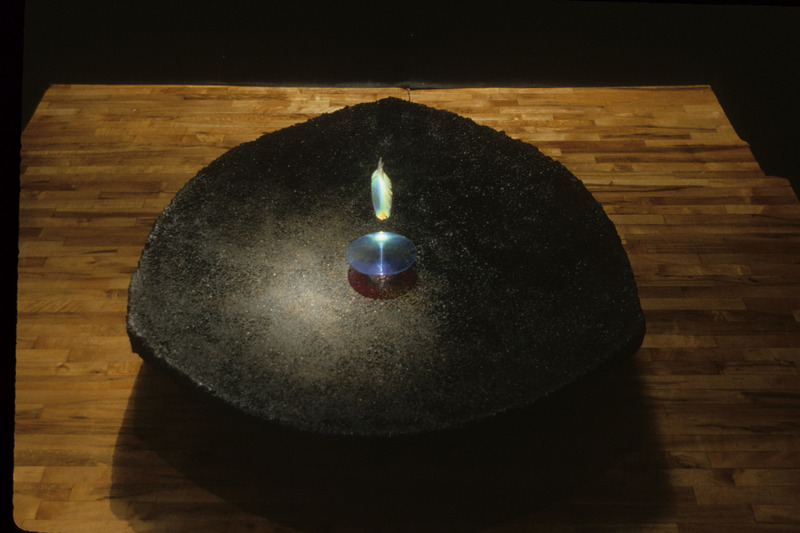 A meditation on holography and its role as a bridge to a possible future, where the ingenuity of light would be one of the keystones to environmentally sound modes of energy production. 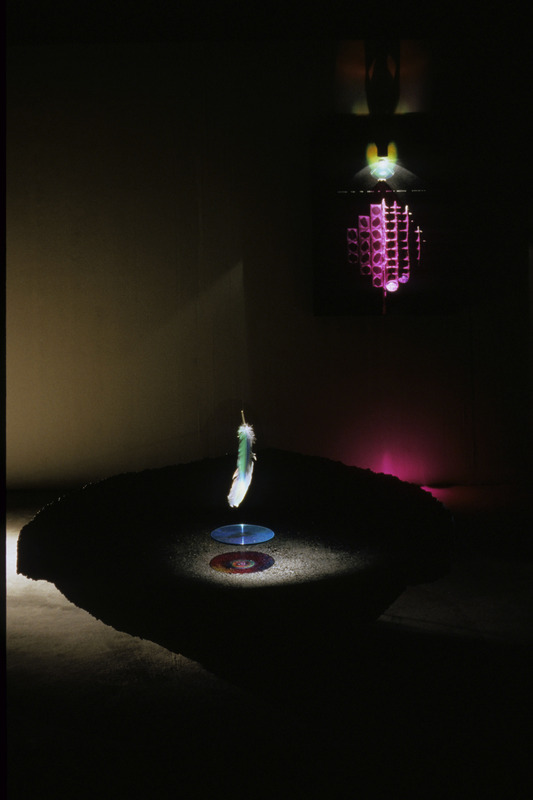 Each of the sculptural objects in the installation interactively uses dichromate holograms drawing the viewer into a dialogue about our current modes of energy production in relation to the health of the environment, and a degrading atmosphere. 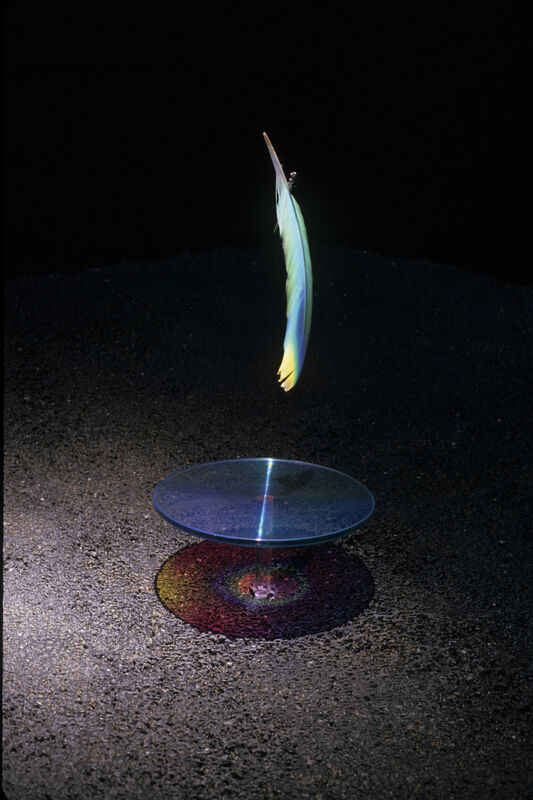 "A Seed", 5 ft. diameter pumice crete dish reminiscent of both a satellite parabolic and a metaté (a tool used to transform corn into flour) holds in its center a circular dichromate hologram which slowly turns causing a transformation of colored light on a white feather suspended above. 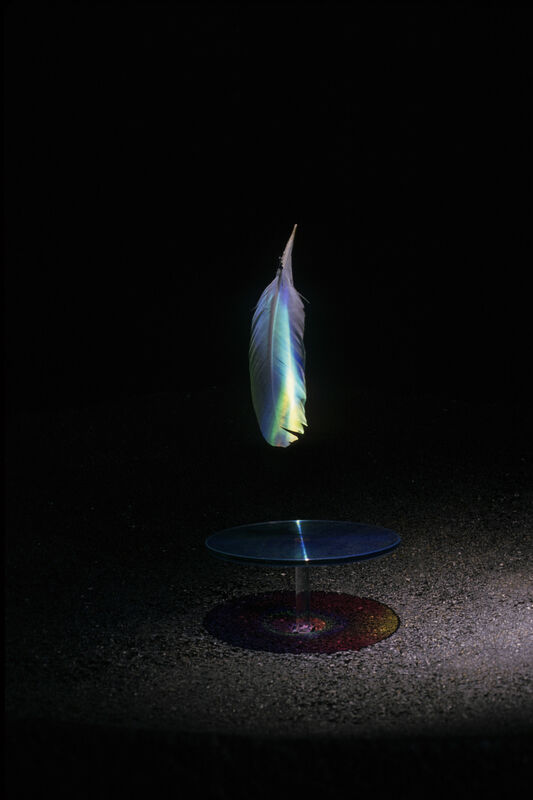 The hologram is made from an optic that bends light to a focal point out in space, and as a result, when lit, splits the white light into its spectrum. 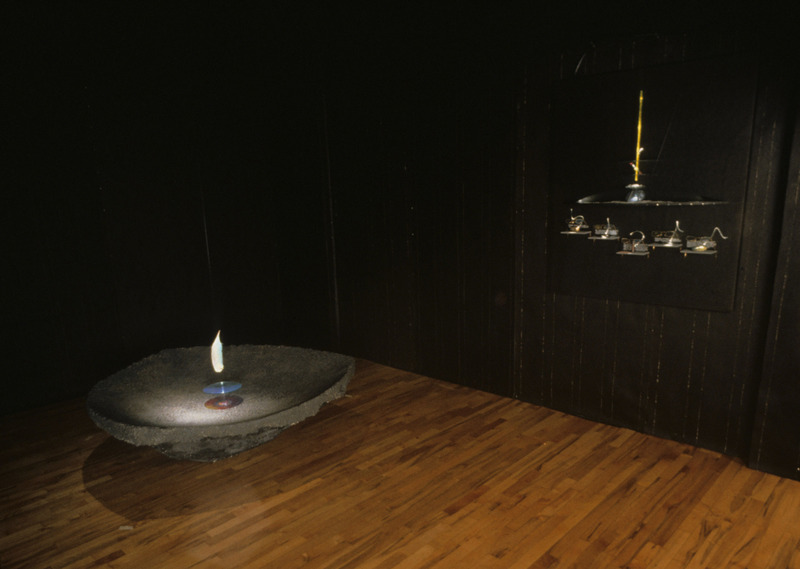 Instead of the hologram recording an object, it captures only light itself. "The Family Tree", reflection on the possibility that the solar cell could yield the productivity within the energy equation that its forebear - photosynthesis - has produced with in the spectrum of life on earth. 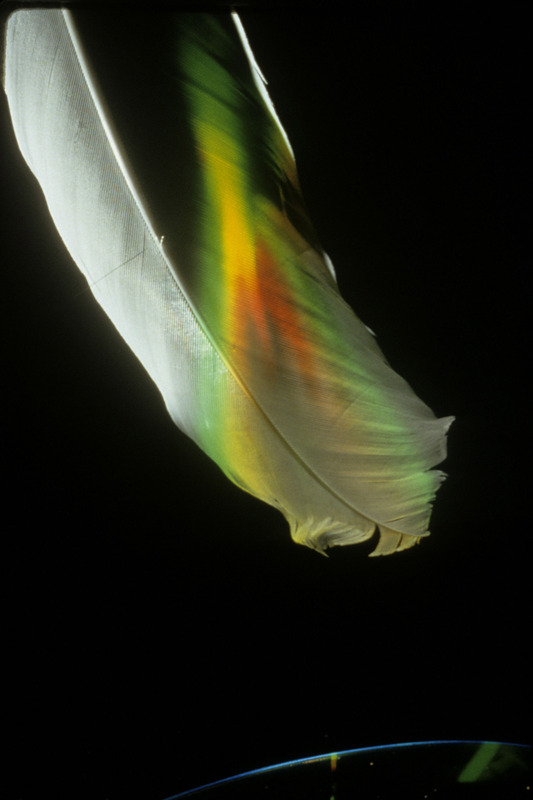 Horsetail reed lit with fiber optics carries through a photosynthesis dance yielding a solar cell. Antique spectacles inspect the predicament of five fossil fuels. 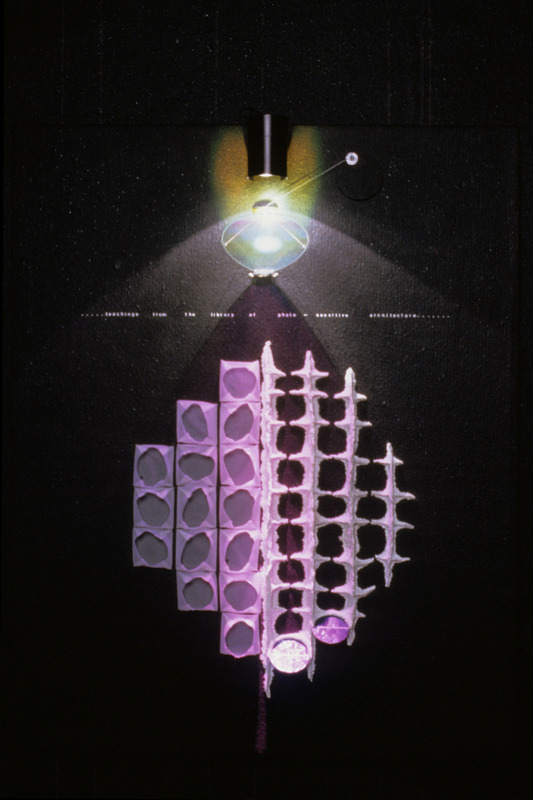 “Untapped Reservoir”, a dichromate hologram of an optic both focuses the white light and bends it like a prism thus as the hologram moves with a motor, under the light source, the cellular/ solar cell structure below transforms through changing frequencies/colors.